Photojournal of naturalist, photographer and writer, Fred First from Floyd County in the Blue Ridge Mountains of Virginia. Started in the spring of 2002, a year when Fred's morning musings in an unexpected sabbatical from an unsatisfying career gave rise to his first book, Slow Road Home. Book two will include many of the digital landscapes and natural history images he has posted at Fragments. Check the sidebar for links to some of his image galleries, his book website, and more. Nameless Creek and the "New Road"--the old horse-traveled postal road--converge about a quarter mile south of the house. They travel side by side, the road often high above the little stream that plunges and riffles its music audibly below. In this image, the roadbed forms the boundary between light and shadow. Here, the rocky fingers of old mountains form a ravine of rhododendron and jumbled boulders, a secluded and special place for us. This far corner of this piece of earth is what won my heart, back this time of year in 1999. Yes, I thought when we first found this "fortress of solitude", this might be the place after all, it whispered to me. Someday, you will come here often in early mornings. Someday, you and Ann will spend an hour late in the evening just watching the day become night. Here, night is becoming day. Morning comes slowly to this deep cleft in the hills. The pine tree beside the lawn chairs--that we could never bring ourselves to put back in the barn--was only head high when we saw it there on our first walk down this way. Things are different now. And things there are just the way they've been since the first settlers found this valley in the early 1800s. The seclusion and peace is unchanged since both Confederate and Union deserters took refuge in this wonderfully-forsaken place. It is the same as yesterday, even on days we don't go there. The Christmas ferns grow ever-green along the banks. The squirrels chatter from the tops of White Pines, shedding fragments of their morning meal like crumbs from the table. The creek sings whether we are there to listen or not. And so this is more to me than just a picture of two chairs lost in the woods. These are my woods, and by the possessive I mean so much more than legal ownership. This place has been ours to become part of. It has grown into us. I feel it most here in this spot, a quarter mile from the house, and in the very heart of home. Seeing an image like this is a great start for my day. 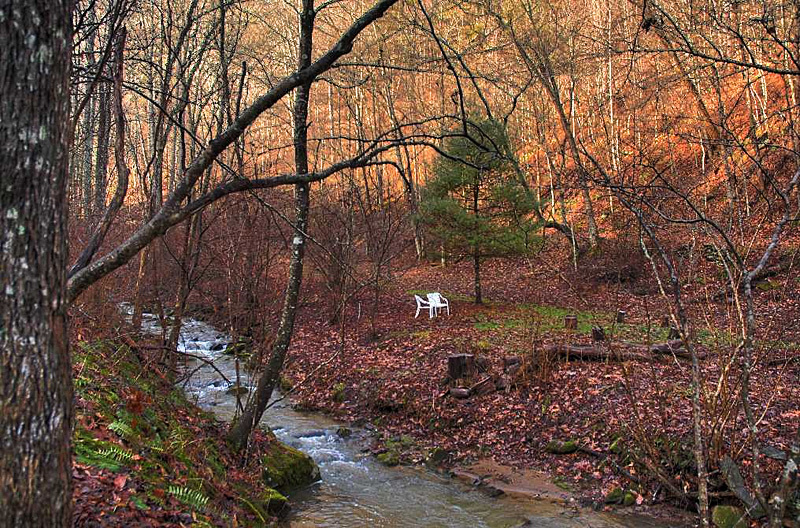 I share you sentiments, though mine are for a little bit of forest on the edge of the Missouri Ozarks. I haven't put our yard and lounge chairs away yet either because I'm in denial. But it seems to be working with no snow yet and springlike days in between colder ones. My son just bought creekfront property that also has a waterfall on it, which will make for a nice Asheville vacation spot for mama. Beautiful picture and sentiments -- make this one "for the book." Every photo you take there on your land is of a special quality, Fred. This one is definitely one for the book and the note cards! The notecards have been well-received, and already folks are wanting sets for spring, sets of Tsuga, images from the book. And I will continue to offer the Book-Plus-Notecards set for $25--a great deal! Thanks for visiting! And if you visit Southwest Virginia in person, take time for stops along or near the Blue Ridge Parkway at Mabry Mill, Chateau Morrisette Winery, and the Rocky Knob overlooks. Travel the Crooked Road, and while in Floyd, have a meal at Oddfellas, browse your favorite regional music at County Records, and come for a Friday Night Jamboree at the Floyd Country Store!